We are about halfway through January of the new year. 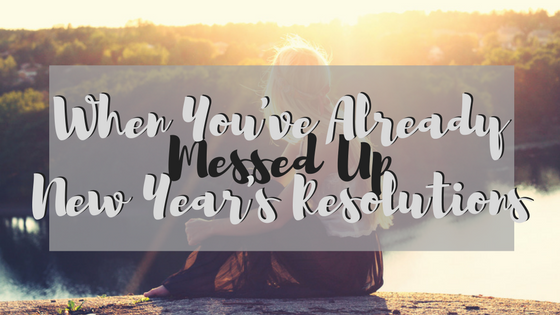 How many of you have already messed up on one of your resolutions? Me. I did it too. You know what, that’s okay. So many people are so quick to give up and not do anything. Let’s not be “those people”, okay? You wanna know when I messed up my resolutions. Day 1. Not even kidding! My 5 year old wanted an ice cream cone, so I paid the crazy prices for ice cream cones and he took about 6 bites before he was done. Yes, that was all he wanted. So here I am, just paid like $4 for a silly little cone and it had barely been touched. So did I throw it in the trash and keep to my diet? Heck no, I’m human, and I ate that thing. All of it! I’m not even ashamed to say I did. But that was totally not a part of the plan for the “choose healthier foods” resolutions. I could just quit and be like “maybe next year”, but I didn’t! I started fresh the very next day. That is what needs to be remembered. It’s okay if you mess up one day, two days, or more. It’s okay as long as you accept that you messed up and try better tomorrow. You shouldn’t expect perfection because hunnie, it is never going to happen. We are human, we aren’t perfect. So here is a quick to do on what to do when you don’t succeed at your resolutions. ¨ Forgive yourself: Don’t beat yourself up to bad. It happens. Mistakes are made and life happens. ¨ Put in a better plan: What if this happens again? Try to think of ways that you can do better if this situation should occur again. Have a plan, so you won’t be caught “in the headlights” next time. Plans always work out better than flying by the seat of your pants. ¨ Wake up the next day ready: Get a good nights sleep, and then on the next day don’t harp on what you did wrong. It’s done and it’s in the past. Keep looking forward and be ready for whatever TODAY will throw at you. How are your resolutions going? Have you fumbled? Are you doing fantastic? Any other advice for other woman reading this that feel they have already messed up their resolutions? Let me know! These are such great tips, DeAnna, especially the first one which is all about grace. I'd also suggest breaking goals up into bite sized pieces. Sometimes we're simply too overwhelmed to achieve the big things, like 'lose weight' or 'pray more'. Knowing how that looks on a daily basis really helps me. Your blog is adorable! Thanks for sharing your heart with others! I have long since given up resolutions. My blog theme this year is "Hope" but in my personal life I have to work on anger. I think there's an angry there that's been so long it doesn't feel angry anymore LOL So, no resolution but a daily "I'll do better than yesterday"!